Try Advisys FREE for 30 days! Can I Afford the Lifestyle That I Want? Which of My Retirement Accounts do I Spend First? Do I Have Enough to Meet my Minimum Needs? How Would an Unexpected Health Issue Impact my Lifestyle? What Are Essential Needs vs Discretionary Needs? What is the impact of working during retirement? About to Retire? Just Retired? Now What? 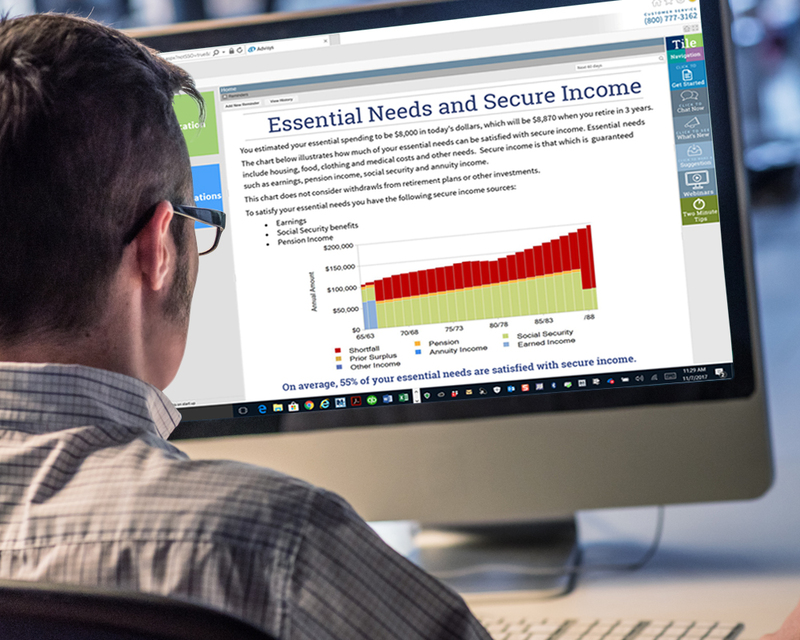 The Advisys Retirement Income Distribution module is for professionals who want to expand the services they provide their clients beyond saving for retirement, to include counseling clients who are retired or nearing retirement on how to make the most of their retirement savings and income. The key to any successful retirement distribution strategy is helping clients understand the difference between retirement “wants” and retirement “needs.” Often retirees can be confused or overwhelmed by the choices they must make and the risks they face that are beyond their control. Advisys Retirement Income Distribution gives you a fast, simple, straightforward way to engage with clients and help them understand the importance of fixed income sources… Social Security, pensions and annuities… to provide income for retirement “needs” such as housing, food and healthcare. And how to use investments and other sources of income that can vary based on market conditions and other factors to fund retirement “wants” such as travel or paying for a grandchild's education. For years, Advisys has been providing educational and concept pieces on topics like minimum distributions, annuities and rollovers to help turn every conversation into a meaningful one. Now, our new distribution analysis module helps further answer the most important client questions, providing a clear, simple understanding of some of the challenges your clients face as they grow older. The reports allow the client to easily see whether the lifestyle they want is the lifestyle they can afford. Other reports help answer whether the market risk clients face can be reduced by repositioning assets to a secure income source like an annuity. Further still, the module allows users to illustrate the impact that a long-term care event can have on retirement funds to see if an LTC policy is a necessary consideration. With inputs as quick and easy to use as the rest of the Advisys platform, preparing for a client interaction surrounding distribution has never been easier. You can still choose the tables, charts and education pieces you would like and customize your presentation with personal branding and logos. Once retirement is reached and funds can no longer be accumulated, the focus of the client shifts to risk mitigation. This new module helps clients understand how things like inflation, market fluctuations, health concerns and longevity play a significant role in the decisions they will need to make from this point on. We’re happy to answer your questions, conduct a demonstration or arrange for a free trial. Free updates throughout the year keep you ahead of tax law and industry changes and add new features. Unlimited planner and technical support instantly by phone, chat or email during regular business hours. Free webinars teach you ways to use Advisys for prospecting, selling, cross-selling and to create referrals. Compliance approved by leading broker dealers. Special discounts may apply. Call toll-free for details.